Credit: Norbert von der Groeben/Stanford School of Medicine. A few days ago, we talked about how contrary to popular notions of delicateness, ancient Egyptian embalmers seemingly forced opened the deceased’s mouth with sharp instruments like knives and chisel – which sometimes led to breaking and dislocating the corpse’s teeth. 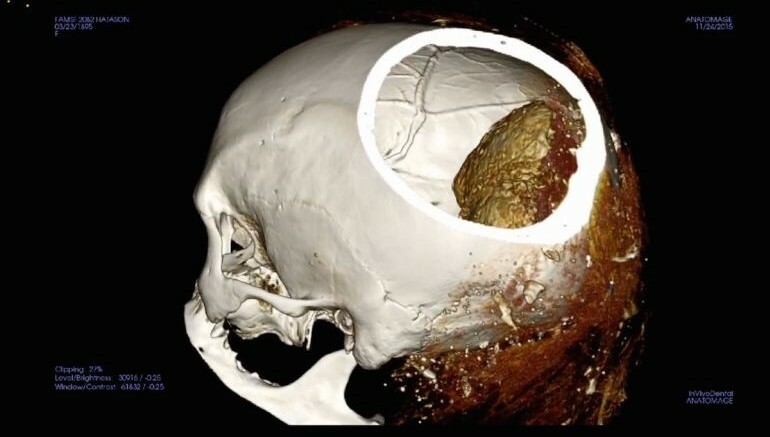 Well this time around, researchers are baffled by another Egyptian mummy specimen, with their analysis revealing dirt-like matter being packed inside the specimen’s head. Believed to around 3,200 years old, the mummy probably belongs to a female, as judged by the shape of its skull. And it is the inside of this skull that has surprised the researchers – who detected a dark sediment by using computed tomography (CT) scan at the Stanford University School of Medicine. This matter was found to reside alongside the actual brain remains of the mummy specimen. As Jonathan Elias, the director of the Akhmim Mummy Studies Consortium, explained how this mysterious dirt-like material was infused inside the brain case, while the brain was left as it was. Suffice it to say, this is very time that researchers have come across such a substance inside a mummy. And as for the identity of this mummified person, all the historians know is that it was nicknamed as Hatason. This was probably a gimmick on the part of the supplier who originally sold the specimen in the 1800’s, and wanted his ‘product’ to sound like the queen figure of Hatshepsut. So in spite of such fake regal credentials, the woman was possibly not of royal blood – with her coffin depicting a woman in the standard dress. However the scientists are still not sure of her origins, since coffins were often reused in a disparate manner when the mummies were sold. Mummies of this period are not very plentiful, so each time we have an incremental change in the technology, we learn much more and are able to say much more than in the past.